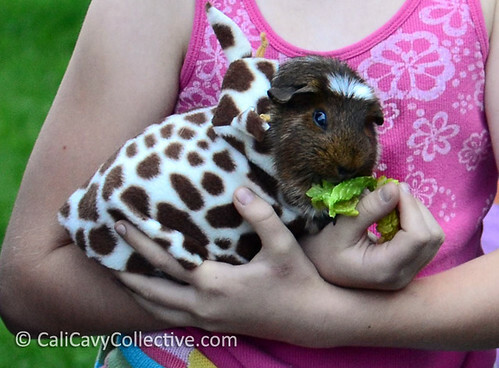 For many, the costume contest was one of the highlights of the 2013 Bay Area Pignic. The competition drew quite a few participants, including a vampire, a rabbit, a giraffe, and a pair outfitted as Romeo and Juliet. First place went to three cavies suited up as the Three Little Pigs from the classic childhood fable. Each were accessorized with a house of straw, wood, or bricks. They even had a big bad "wolf" standing guard nearby. 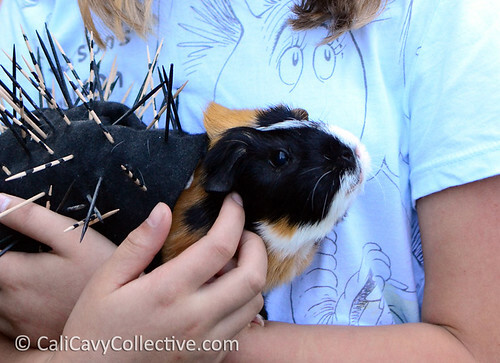 One girl constructed a particularly creative porcupine costume out of toothpicks. No peegs were poked and the ensemble was removed immediately afterwards. 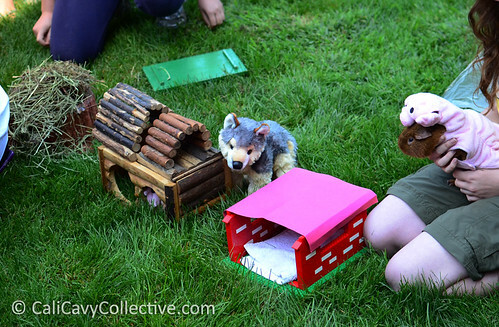 My favorite costume was a girl who outfitted her guinea pig as a compost machine. The girl's reasoning was that food went in one end and out the other as material well suited for composting. Clever and incredibly accurate! What's the most creative piggy costume you've ever seen? 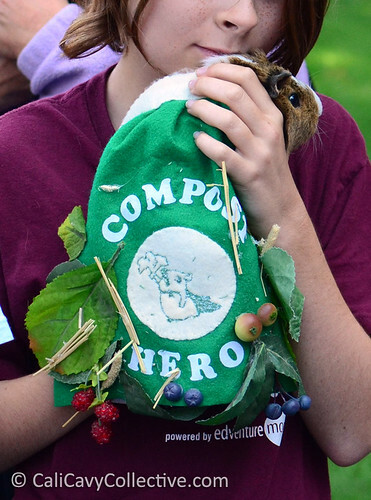 I didn't even see/recognize the embroidery of the guinea pig "compost champ" that she put on the bag! So cute, such creative details! I was running around taking photos, but Revy did get a brief moment to complain about her hula pig costume! My George has a bumble bee costume. I loved the 3 little pigs, so cute! Did you dress yours up? Compost heroes indeed! Love it! I love the porcupine costume. She did a great job with that. The compost machine is pretty good, too. My favorites are the truly homemade costumes. We had a Katniss (from Hunger games) and a "dad" pig (who wore one of those silly beer-hats that was made from construction paper and pipe cleaners). You know some thought and work went into those! Offering edible bribes is an effective method of soothing ruffled feathers - or in this case, fur! Pretty typical. Many pigs are determined to go au naturel. Some don't mind as much if you keep it to something less restrictive like a hat rather than a full on outfit.